XS (S, M)[L, XL, XXL]. If you purchase 5 of my self-published designs at the same time (they need to be in the same cart), you will get the least expensive for free! 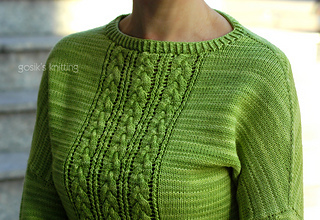 Three Braids is a seamless pullover knit from the top down with subtle dolman sleeves. The design uses an adaptation of the contiguous method of shaping set-in sleeves developed by Susie Myers. Interesting construction, the subtle dolman sleeves (which can be easily modified) as well as the cabled pannel on the front will keep you motivated until the bottom rib resulting in a modern pullover for everyday use. XS (S, M)L, XL, XXL. Finished Bust: 88 (93.5, 104.5)117.5, 126.5, 139 cm / 35.25 (37.5, 41.75)47, 50.5, 55.75 inches. The pullover is designed to be worn with 10-15 cm / 4-6” of positive ease. Sample shown in size M on 93 cm / 37” bust. 3 (3, 3)4, 4, 4 skeins of Malabrigo Arroyo (100% merino; 100g / 335y) or approx 755 (810, 910)1000, 1085, 1205 m / 830 (885, 995)1090, 1185, 1315 yards. Sample made in colorway 58 Borrajas. 4.0 mm / US #6 needles, or size needed for gauge - 80 cm / 32” circular and dpns. 3.75 mm / US #5 needles, or one size smaller than gauge needles - 60 cm / 24” circular and dpns. 4.5 mm / US #7 dpn (used for 3-Needle Bind-Off only). cable needle, interlocking stitch markers, tapestry needle for weaving, stitch holders / scrap yarn. 22 sts and 32 rows over 10 cm / 4” in St st worked flat with larger needles, 4.0 mm / US #6, after wet blocking. Take time to save time - check your gauge. If necessary, adjust needle size to obtain the correct gauge. Questions? Join Justyna’s group Lete’s Knits. Polska wersja opisu jest również dostępna!